Traditionally, weight-loss practices were based on cleansing, regulating, and strengthening the body’s energies to remove imbalances and return it to its natural state of equilibrium. Today we can draw upon these ancient wisdoms to heal our body, mind, and emotions on a holistic level, in addition to permanently releasing our excess weight. Ancient Acupressure Healing: Regulates and empowers the energy body. • Regulate the appetite: place the fingertips directly below each cheekbone and press gently. • Suppress hunger: place the fingertips on either side of the base of the neck and press gently. • Decrease sweet cravings: massage the thumbs to strengthen the stomach and spleen energy. • Improve digestion: firmly massage the entire webbed area between each thumb and index finger. • Balance hormone-related weight gain: firmly massage around the wrist bones, ankle bones, and heels, concentrating on any painful areas. • Balance emotional-related weight gain: firmly massage each ear to release the body’s natural endorphins and calms the nerves. • Place the ring fingers at the base of each thumb. • Place the tip of each thumb on the outside edge of the middle joint of each ring finger. • Relax and extend the index, middle and little fingers. 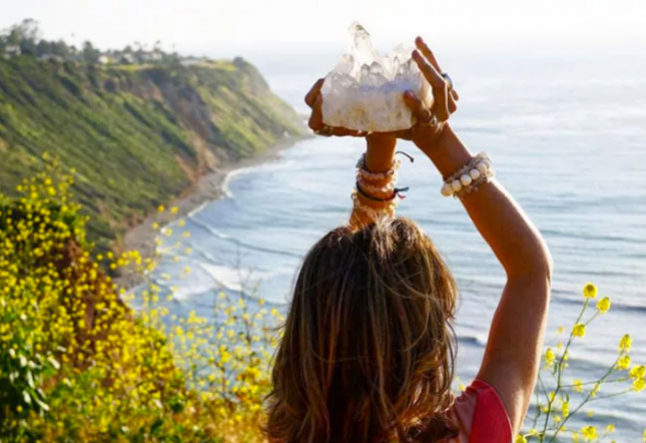 Ancient Crystal Healing: Raises the body’s positive vibrations. • Chrysocolla: strengthens digestion, quiets the mind and alleviates stress-related eating. • Bloodstone: detoxifies the physical body, increases metabolism and grounds the emotions. • Blue Apatite: regulates the glands, suppresses the appetite and calms the mind and emotions. Ancient Color Healing: Harnesses the sun’s energy to balance the chakras. • Fill a yellow-colored sterile glass bottle with filtered water and cover the top. • Place the bottle outdoors on a piece of wood, away from strong colors. • Leave for up to eight hours to absorb the sun’s healing rays. • Drink one glass of the yellow healing water, three times a day. • If a yellow bottle is not available, double-wrap yellow cellophane paper around a clear bottle. • Practice for six weeks during the spring or summer. Ancient Healing Oil Massage: Calms and restores the hormones and nerves. • Ginger oil: reduces sweet cravings. • Lemon oil: increases energy and releases excess fat. • Fennel oil: suppresses the appetite and improves fat burning. • Cinnamon oil: enhances metabolism and reduces the body’s ability to store fat. Using the oils, massage the abdomen daily, for ten minutes, starting at the naval and working outwards in a clockwise direction, in small circular motions, to activate sluggish digestion and release anxiety. Ancient Plant Healing: Rejuvenates the body, mind, and spirit. Holy Basil Leaf alleviates stress and stimulates the liver to improve fat metabolism. • Add one teaspoon of holy basil powder to a cup of boiling water and infuse for a few minutes. Strain and drink after each meal. Fenugreek Seeds: effectively suppress the appetite by creating a feeling of fullness. • Soak one tablespoon of seeds in a cup of cold water overnight. In the morning, blend the mixture and drink on an empty stomach. Turmeric Root: prevents excess fat deposits. • Grate a three-inch piece of fresh turmeric root. Add half a cup of water and leave to infuse for thirty minutes. Strain and take one-third of the infusion with each meal. In combination with these ancient techniques, following a raw food plant-based diet for up to three months will help permanently release excess weight. Food eaten in its raw natural state has a detoxifying, calming and balancing effect on the endocrine glands, which in turn regulates the hormones, releases food addictions and alleviates emotional eating. Practice and discover the techniques that resonate with you most. By devoting a few minutes each day, you will gently initiate your body’s natural self-healing ability to slowly and permanently release excess weight!